Shortly after having finished the toolholder for the R8/Bridgeport and Cat40/HAAS toolholders (Blog post here! ), I was feeling inspired to do something similar on our lathe. I wanted as simple a tool storage solution as possible while remaining within reach. I usually put the tool holders in the drawers under the lathe, but that is slow and inconvenient when enthusiastically machining things. 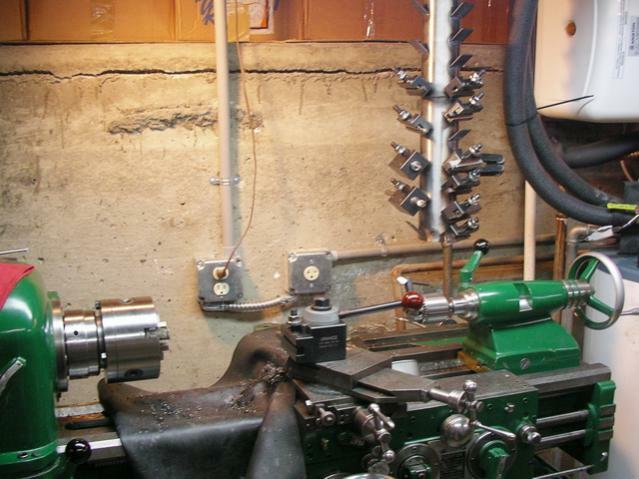 As a result, I usually end up setting them in the chip tray underneath the lathe or on the headstock to the left of the chuck. The problem is, the chip tray becomes a labyrinth of sharp, barbed-wire-like steel shards and the headstock needs to be opened any time I change spindle speeds! I was looking around at different elaborate solutions and came across some really neat ways of storing the tools, but they were all complicated, expensive, or wouldn’t work with our layout. One of the complicated solutions was a rotating “tree” with short pieces of steel angle welded to it. Apparently, Aloris AXA and BXA tool holders lock onto a 1-1/4″ piece of regular steel angle quite nicely! I decided to take that and run with it, so I went to Alro Metals Plus up the road and purchased 18ft of steel angle and made it out the door for about $20 (Including cuts to 6ft so it fit in my car!). Once back at FamiLAB, I checked the fit on the tool holders, drew a quick sketch, and got to work! I cut the steel into two 5ft uprights, two 1ft feet, and three 2ft cross beams using the Ryobi abrasive saw in the metal shop. It’s great for this task, but absolutely wear eye and ear protection! Next, once I had the pieces cut, I cleaned up the sharp edges on the bench grinder and slightly chamfered them in preparation for welding. Over in the welding area, I cleaned off the table and placed my first pieces roughly in their positions. Magnets were used to clamp them in place and I nudged the cross members into alignment. Grabbing an auto-darkening mask (To protect from the intense UV light emitted by the arc welding process), apron, and welding gloves, I fired up the old Craftsman stick welder. 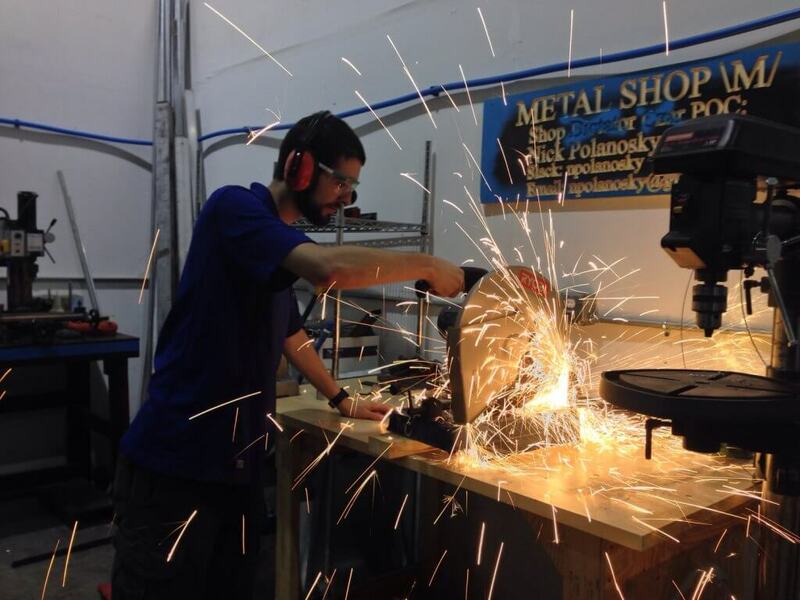 I could have used our fancy Lincoln Electric MIG, but things were still displaced from Maker Faire Orlando and I didn’t feel like going through all of the setup for such a short project. Anyway, there’s something “Zen” about stick welding…MIG is like a sort of like using hot glue gun- Anyone can do it pretty easily. Welding stick/SMAW is a challenge and an entire art form in and of itself. After reading on sites like https://latheexperts.com/top-5-best-metal-lathe/ I learned a few new tricks and I was inspired. I got to work using a 7014 alloy welding stick, I tacked the pieces together to hold them in place, then went back in and filled all of the gaps in. Gradually the frame took shape as I rotated it to different positions and attached more steel. Eventually I attached the feet and it was self-supporting! I set it on the ground, cracked the slag off with a hammer, cleaned up a few joints with a grinder, and I was done! I grabbed the can of FamiLAB blue paint off of the paint shelf and went out to the parking lot to claim it as part of the lab. There you have it! A quick metalworking project that cost $20, took 50 minutes from beginning to end, and added function and style to the machine shop! 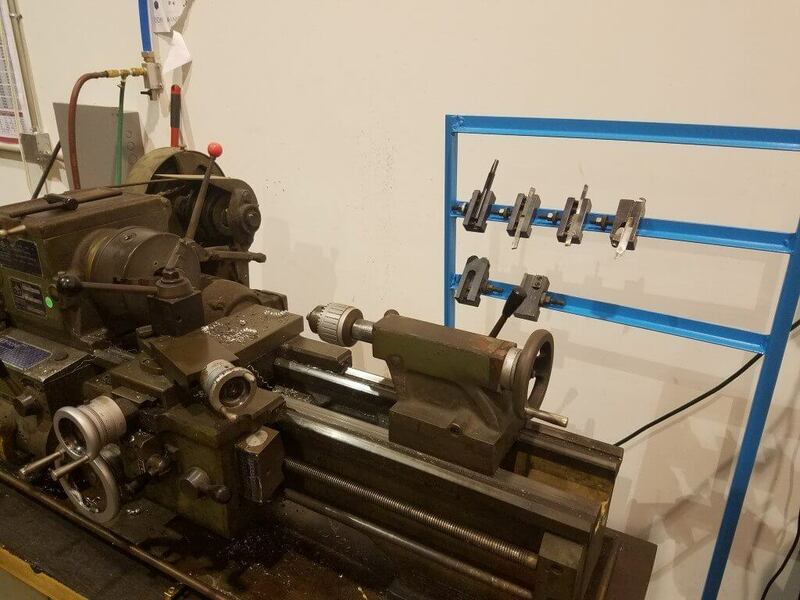 The tools fit perfectly and the rack has significantly improved the workflow at the lathe, while helping to prevent the bad habit of setting tools on and under the machine. Thanks for sharing. The rack looks awesome!